All of our agency workers receive the appropriate induction training and annual updates directly from Twenty Four Seven Nursing. The majority of the courses are delivered face-to-face in our purpose built training suite and the rest are completed online. 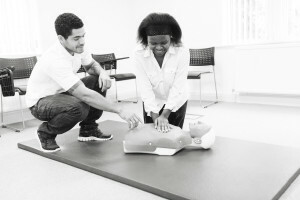 We have experienced trainers, Nathaniel Jean-Baptiste and Francis Robinson, who can deliver courses in: Safer People Handling, Dementia Awareness, Managing Violence and Aggression, Breakaway Techniques, Physical Intervention, Basic Life Support, Safeguarding Adults and Medication Awareness. Our in-house Registered General Nurse (RGN) Lesley Thornton delivers Training to all our staff to enable them to perform accurate manual and mechanical vital observations, using a competence based assessment. Workers can only achieve this competence through an understanding of the theory and relating this to practice and Lesley’s years of experience working on wards enables her to impart practical guidance. Her training gives our workers knowledge of ‘normal’ parameters to ensure that they are fully aware of the need to inform the nurse in charge of any anomalies to the patient’s vital signs. This means that we can be absolutely sure that all our temporary workers are completely ready for the appropriate shifts before we place them anywhere. We deliver all our own training, enabling us to be proactive in ensuring that all workers are completely up to date.